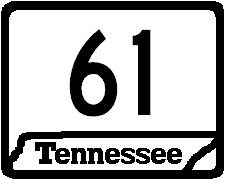 Tennessee State Route 61 is an east-west highway in East-Central Tennessee. It runs from U.S. Rt. 27/70; Tennessee State Route 1/29, at Rockwood, to U.S. Rt. 11W/Tennessee State Route 1, at Blaine. Info on TN St Rt 61 is broken down by county below.